Tobacco rattle virus-infected plants often have leaves with yellow line patterns. Rachel Zwieg* and Brian Hudelson, UW-Madison Plant Pathology *Completed as partial fulfillment of the requirements for the Horticulture track of the Farm and Industry Short Course program at the University of Wisconsin Madison. Tobacco rattle is a common and potentially serious viral disease that affects a variety of herbaceous ornamentals including, but not limited to, astilbe, bleeding heart, coral bells, daffodil, epimedium, gladiolus, hyacinth, marigold, tulip and vinca. Tobacco rattle can also affect vegetable crops such as beans, beets, peppers, potatoes, and spinach. On potatoes, the disease is referred to as corky ring spot (see University of Wisconsin Garden Facts XHT1186). What does tobacco rattle look like? Symptoms of tobacco rattle can vary depending on the plant species or variety/cultivar affected, and depending on environmental conditions. 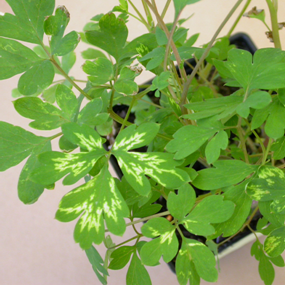 Infected plants may exhibit mottling (i.e., blotchy light and dark discoloration of leaf tissue), yellow ring spots or line patterns, localized necrotic lesions (i.e., dead spots), chlorotic (i.e., yellow) spots or streaks, or leaves with notches. Plants that become infected at a young age can also exhibit a variety of leaf and stem deformities. In potato, the disease can also manifest itself as a series of corky arcs or rings in tuber tissue. Where does tobacco rattle come from? Tobacco rattle is caused by the tobacco rattle virus (TRV) which is spread primarily by stubby-root nematodes, a group of microscopic, worm-like organisms in the genera Trichodorus and Paratrichdorus. These nematodes feed on the roots of infected plants, acquiring TRV, then move to non-infected plants where their subsequent feeding spreads the virus. TRV can be spread mechanically when pruning tools or knives that are used to trim or divide plants become contaminated, and by grafting. TRV can also be found in seeds from infected plants. How do I save a plant with tobacco rattle? 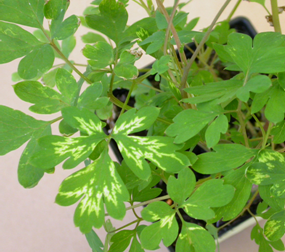 Once plants have become infected with TRV, they remain infected indefinitely. Infected plant cannot be treated in any way to eliminate the virus and should be removed and disposed of by burning, burying or composting. How do I avoid problems with tobacco rattle in the future? The best way to prevent problems with tobacco rattle is to grow plants that are not susceptible to TRV. Such plants include, but are not limited to, annual phlox, carnation, devil’s trumpet (downy thorn-apple), sweet William, zinnia and zombie cucumber. Carefully inspect susceptible plants for symptoms of tobacco rattle prior to purchase and do not buy symptomatic plants. When pruning or dividing plants, be sure to clean tools between cuts by dipping them for at least 30 seconds in a solution that is a combination of 1% sodium lauryl sulfate (use 10% shampoo as a source of this chemical) and 1% Alconox (an industrial detergent). This will help prevent the mechanical spread of the virus. Control of the nematodes that transmit TRV is not practical in home garden settings.